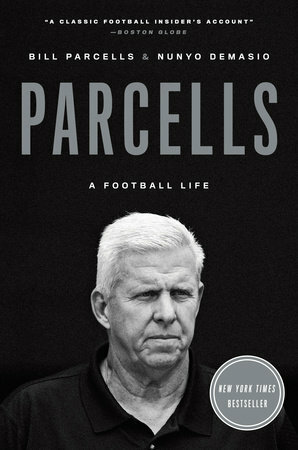 The story behind Parcells: A Football Life is almost as intriguing as the iconic coach himself. The 544-page biography took six years to complete -- after I had spent several months trying to persuade Bill Parcells to cooperate. Nonetheless, all the effort paid off with: a preemptive offer from the world's biggest publisher, a New York Times bestseller and terrific reviews. Perhaps the neatest aspect of the project were notes from Warren Buffett and President George W. Bush, both of whom make cameos in the book. (Don't tell "W" that I had voted for his opponent.) Legendary authors John Grisham and Gay Talese were also kind enough to send me letters. For a comprehensive look at the project, visit parcellsbook.com. And to view the other notes, click on each image or use the half-arrows (to go back and forth). On Labor Day 2016 -- a couple years after the release of Parcells -- a podcaster, Matthew McQueeny, with a quality show based in New Jersey visited me in Manhattan to tape an episode focusing on the biography and on my career.